Nokia, best known for being the world’s number one mobile phone manufacturer (and mapping company, and camera manufacturer, and…well, you get the idea!) have amazed the world today with the announcement of a new media streamer. Nokia have not exactly been visible in the music device market, but the new Nokia Home Music streamer could be about to change all that. The Nokia Home Music is, first and foremost, a music streamer, pitched squarely at the likes of the Logitech Squeezebox. Nokia’s little number is slightly different, though. Whereas the Squeezebox sits between your PC and Hi-Fi, letting you stream your tunes from your PC and listen to them on your (presumably) better-sounding amp and speaker combo, the Nokia Home Music sits between pretty much everything and your Hi-Fi. You can stream your tunes from your PC, your mobile phone (naturally! ), an MP3 player (via USB) or even directly from the Web. 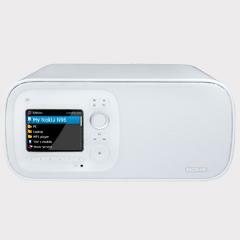 In short, anything with a USB connector or that supports UPnP can connect with the Nokia Home Music System. As far as connectivity goes, Nokia’s little box supports both Ethernet and Wi-Fi for Internet and PC streaming. It also comes with an FM receiver, and will connect to dozens of Internet Radio stations. It has a great looking display, which will display the contents of the connected device, and you can control your playlist directly from the Home Music’s LCD screen via a remote control, rather than from the connected device. There’s even an SP/DIF optical connector (for digital connections) and RCA line-out (for analogue connections) to hook up to literally any Hi-Fi ever made, a standard 3.5mm headphone jack, and, as if all that wasn’t enough, a 10W built-in speaker, just in case you haven’t got your Hi-Fi switched on yet and you really need to hear that new tune from Timmy Mallet!!! Frankly, I’m in disbelief. This has to be the media streamer that has everything – looks, all the connectivity you could ever need, and exactly the right level of features to make it a must have. I’ve been after a media streamer now for some time, and I think I’ve just found it! Shame it’s not going to be available in time for Christmas, but I’m sure I can persuade the Easter Bunny to give me a Nokia Home Music system next year, rather than the half a hundredweight of chocolate he normally leaves! I’ve been excited by Nokia’s new N97 phone that was also announced today, but this is just the icing on the cake!